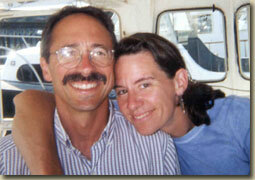 Co-founders Lisa Wolf (executive director and educator) and Steve Wolf (captain and educator) founded HOBBES based on their shared expertise and backgrounds as scientists, sailors and educators. Between them they have 25 years of experience as practicing hydrologists, 18 years as formal and informal educators, two lifetimes of seafaring adventures and a passion for the sea. Steve has also held a Coast Guard captain’s license since 1985.